Just as rose bushes and thorns go hand-in hand, so do aphids and ants on the popular garden flower. Yet, the beauty of your rose bush does not have to succumb to a trail of ants. Decide on a method of treatment--chemical or natural--to control the pests and follow it consistently. By practicing good pest management, gardeners can treat one pest, the aphid, and spare themselves the activity of another, the ant. The ants are attracted to rose bushes because of a common rose pest, the aphid. Aphids secret a sticky, honeydewlike substance that ants eat. Keeping ants away from rose bushes means it is necessary to effectively control the aphid population. Aphids can be successfully controlled with one of several nontoxic methods. Hosing down a rose bush with a good stream of water will remove the unwanted pests. Insecticidal soaps and sprays made with neem oil offer an additional chemical-free option. 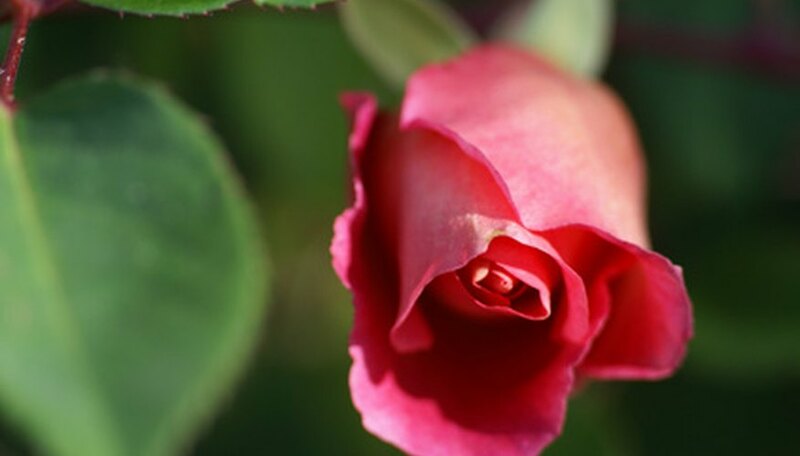 Aphids do not like potassium, so placing a banana peel at the bottom of the rose bush will also deter the pests. To control aphids with chemicals, use an insecticide spray that contains pyrethrin. The spray should be applied in the early evening to avoid harming beneficial insects such as bees. Treating the insects with chemicals last longer than with nontoxic means, but its environmental impact should be considered. Aphids become active on rose bushes beginning in the early spring and tend to stick around through June. Watch rose bushes closely during this time as ant activity will very likely soon follow if the aphids are not treated. Ants do not cause any physical damage to rose bushes. Again, it is the feeding activity of the aphids that can cause the flowers to become malformed or even cause them to become discolored.